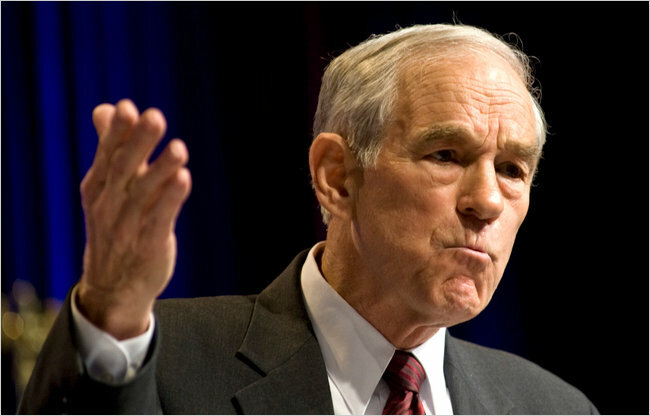 Ron Paul is author of the best-selling book “End the Fed.” He has denounced the Fed as a cause of inflation. A congressman from Texas, long a dissident critic of the Federal Reserve, is scheduled to become the chairman of a House panel with jurisdiction over the central bank. It promises to be a miserable time for the Fed chairman as he is peppered with hostile questions at oversight hearings and with legislation to force complete audits of Fed operations. So it is now, with Representative Ron Paul about to take over as chairman of the Domestic Monetary Policy Subcommittee of the House Financial Services Committee. Mr. Paul campaigned against big banks, arguing that concentrated financial power goes hand in hand with concentrated political power. A joke during Mr. Patman’s tenure was that the reason he chose a bright red carpet for his office was to hide the blood stains after William McChesney Martin Jr., then the Fed chairman, emerged from private meetings. Among the bills Patman pushed was one to audit the central bank. The Dodd-Frank Act passed this year allows for limited audits, and extending them is a centerpiece of Mr. Paul’s agenda. Patman bitterly fought big bank mergers, while Mr. Paul condemns allowing banks to become too big to fail. There are major differences between them, aside from the fact one is a Republican, while the other was a Democrat. Mr. Paul is a sound-money man who longs for the gold standard and thinks the collapse of paper money is inevitable. Patman was far more sympathetic to printing money, even voicing outrage during the Depression at the idea that government would pay interest to borrow money. Why not just print it, he asked? Mr. Paul denounces the Fed for causing inflation, saying that producing inflation is the major reason for its existence. In 1937, Patman proposed legislation to require the Fed to stabilize the purchasing power of money, but he had something different in mind. He wanted to restore price levels to what they had been in 1926. To do that would have required inflation of about 25 percent to reverse the deflation of the Depression. Another difference is the role a landslide played in regard to both men. In 1974, the Watergate wipe out produced a flood of liberal Democrats who were determined to put aside seniority as a strict determinant of chairmanships. Patman, who had been in the House since 1929, was ousted in a move that no doubt pleased the Fed. He died in 1976, just before Mr. Paul entered Congress. The Republican landslide this year elected several representatives sympathetic to Mr. Paul’s views, and weakened the party establishment that had previously kept Mr. Paul from being chairman of a subcommittee. This week Representative Spencer T. Bachus of Alabama, the incoming chairman of the Financial Services Committee, announced that Mr. Paul would have the job. Mr. Bachus has endorsed Fed audits that go beyond the limited review called for by the Dodd-Frank Act, but he is anything but hostile to banks. He told The Birmingham News last week that “my view is that Washington and the regulators are there to serve the banks.” The News said he “later clarified his comment to say that regulators should set the parameters in which banks operate but not micromanage them.” His press secretary said he was too busy for an interview. Mr. Paul takes on the subcommittee post at a time when the Fed is far better known than it was in the 1960s, and after its reputation has alternately soared and plunged. It was given credit for the long booms of the 1990s and earlier this decade, and for steering the economy out of the mild 2001 recession. There was criticism of its role in the technology stock bubble that preceded that downturn, but it was mild compared with the excoriation the Fed received for its failure to counteract the housing bubble that led to the recession that began in 2007. In the past, the majority in Congress, whether Republican or Democrat, was generally supportive of the financial establishment. That is still true, but the support has frayed amid resentment over big bonuses going to bankers whose jobs might have vanished had the government not bailed them out. Many Republicans embrace Mr. Paul’s criticism of the Fed’s role in the bailout and in the current monetary easing, which involves buying $600 billion in longer-term Treasury securities. Fortunately, for both the Fed and the economy, the signs seem encouraging. The retail sales report this week was stunningly good, signaling a strong economy in the current quarter and into next year. The tax deal worked out between President Obama and Republican lawmakers will provide economic stimulus, even if it is not particularly efficient. One sign of economic optimism is surging interest rates on long-term Treasuries. During the first 10 trading days of December, the yield on 10-year Treasuries rose from 2.8 percent to almost 3.5 percent. It has been nine years since yields rose that much over so short a time. Then markets were beginning to suspect the 2001 recession was ending, as it was. Markets now seem to expect a much better recovery next year than we saw this year. Mr. Paul was careful not to predict legislative success. “I’m not making any rash promises,” he told me. “I’m up against a lot of influential and very powerful people. They’ve been able to work in secrecy since 1913,” the year the Fed was established. The idea of hostile Congressional hearings making a Fed chairman miserable may seem surprising to those with memories that go back only to the era of Alan Greenspan as oracle. But there is a rich precedent. Paul Volcker took his share of lumps when he was driving up interest rates to stop inflation, and bringing on a severe recession in the process. Now he is revered, in large part because he was successful. If the economy fails to revive and inflation surges — in other words, if Ben Bernanke’s term as chairman looks like a failure — pressures for fundamental changes at the Fed could become irresistible. But for the time being, it is likely that Mr. Paul’s new post will provide more entertaining hearings than actual legislation.